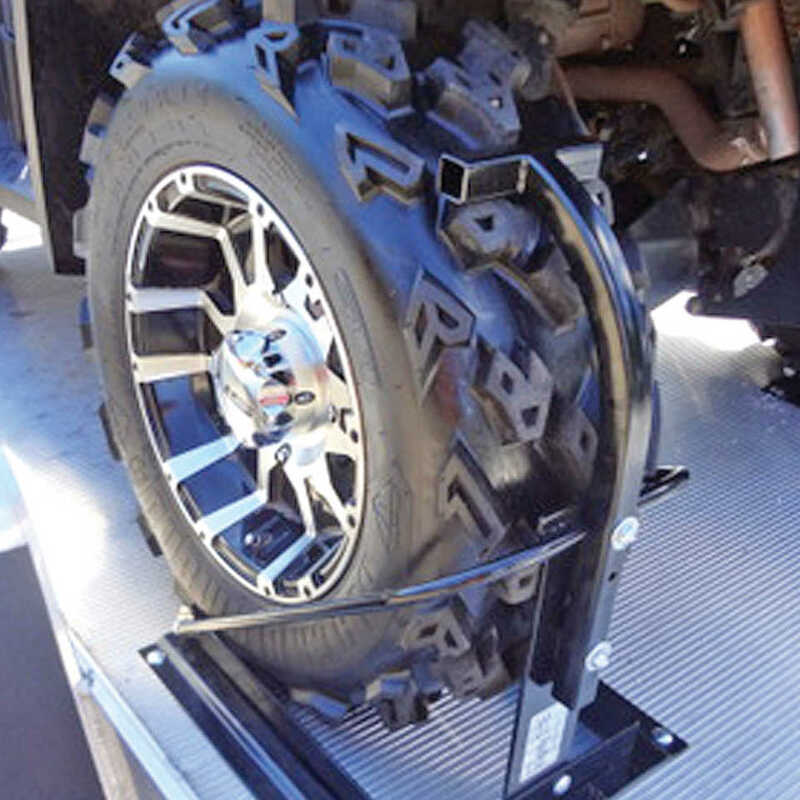 With the Mighty Tite installed on our trailer we know our machine will be secure and can handle any road trip safely . The Mighty Tite tie down system relies on steel chocks that capture the front tires, and a beefy, steel chain at the rear. Unlike fabric straps that will fray, stretch, and usually work themselves loose, once you have the Mighty Tite set, your ATV or Side x Side is locked down to the trailer until you’re ready to unload it. About the only way to lose a machine with the Mighty Tite in place is to roll the trailer, and at that point you’ve probably wrecked the trailer and your truck too. One of the biggest advantages of the Mighty Tite system is you can lock it down by inserting a padlock through a set of holes at the rear lever bar. That’s a great feature for overnight trips when your machine may have to spend a few nights unprotected on the trailer. It’s a level of security a fabric strap tie-down can’t match. Since the Mighty Tite is a mechanical system it must be bolted to the trailer first though. Bolting the front wheel chocks to the trailer would definitely help secure your machine, but it would also reduce usable trailer space. The QWIK Release people found a unique way around that problem when developing the Mighty Tite by allowing the front wheel chocks to be removed, freeing up the space for other loads. Both front wheel chocks slide into a mounting plate that first bolts to the trailer deck. There are a couple things you need to do before bolting it down however. The Mighty Tite front wheel chocks slide into a receiver plate that is bolted to the trailer bed. The chocks capture the wheels and basically lock them in place thanks to the bar that follows the tire profile. For safe towing you want to distribute the weight evenly over the trailers axles. This includes the weight of extra gear, fuel cans, and whatever else you are likely to be hauling. When properly loaded the trailer should have about the same tongue weight as when empty. Not excessively heavy nor too light on the front end, but definitely not biased towards the rear which will cause your truck rear end to bounce. Once you find the proper location for your machine, mark the holes in the mounting plate and then drill them through the trailer deck. TIPS: For trailers with wood decks do not drill the holes between seams in the boards. Reposition the mount plates slightly if needed. Use large washers on the underside for more clamping surface against boards. Nylock nuts are a good idea to hold everything in place as well, and we also recommend using Grade 8 bolts which have higher tensile strength. Remember, the bolts are the clamps which hold your machine to the trailer. With the front mounting plates installed it’s time to bolt down the rear locking plate. The rear plate on the Mighty Tite load security system uses a lever, heavy duty chain, and a slotted hitch insert that slides into your machines receiver hitch. To secure your machine you slip the chain into the correct slot in the receiver insert and push down on the locking lever. This places tension on the chain which in turn pulls down on your machine suspension, insuring constant tension. It’s quick, easy, and very secure. With the front wheels held in place by the wheel chocks and the rear end clamped down by the locking lever and chain, your machine isn’t going anywhere until the trailer moves. Whether you’re off for a day on the dunes or trails, heading to the deer camp for a week, or hauling your ATV or Side x Side to the construction site, nothing would ruin your day faster than having your machine unload itself on the highway. 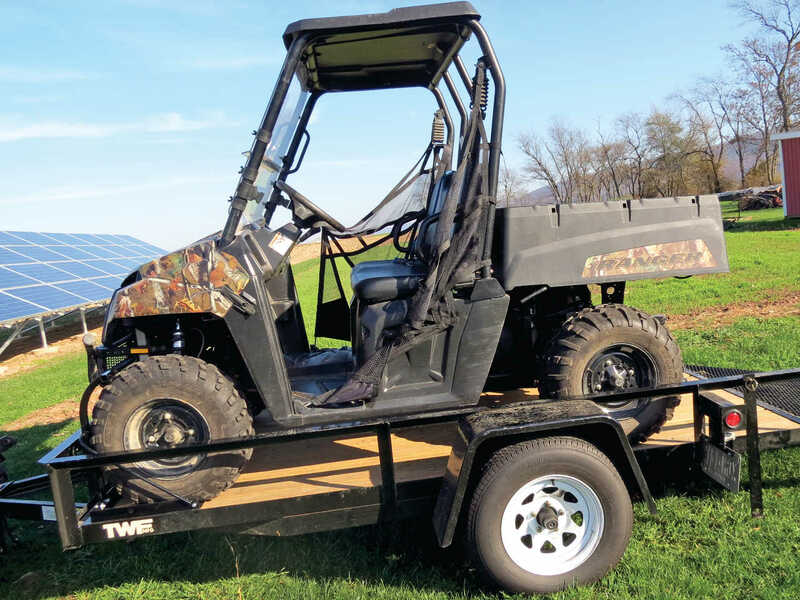 A typical utility ATV weighs a little over 600 pounds, a Polaris Ranger 800XP tips the scale at 1,300 and some machines easily exceed 1,500. Bargain basement straps aren’t going to get the job done. Your machine has cost you a pretty penny – consider the Mighty Tite your trailer protection system.